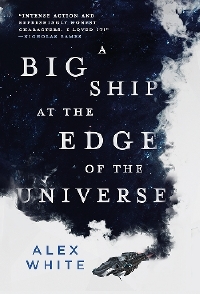 I'm currently reading an advance copy of Alex White's upcoming sci-fi novel, "A Big Ship at the Edge of the Universe" (humble brag) and I'm really digging it. A true genre bender of a space opera, it introduces a unique magic system into what would otherwise be a grounded sci-fi tale about a ragtag team of fortune hunters. Fans of Cowboy Beebop and Firefly will both recognize and rejoice in the cast of colorful rogues. The book comes from UK publisher Orbit who have revealed the first three chapters of the book on their website. I recommend giving them a read if you haven't already pre-ordered the book. White's most recent novel was Alien: The Cold Forge, the latest Alien tie-in novel from Titan Books.